Kinect is dead. The writing has been on the wall for years, at least since Microsoft de-bundled the motion-tracking system from the Xbox One in 2014, knocking $100 off the price tag and making the system more competitive with the PlayStation 4. The Kinect debuted in 2010 with the Xbox 360, and it had a good run, overall: Microsoft sold roughly 35 million devices in total. However, across its iterations and upgrades, the Kinect never quite found its market — the one application that would turn the hardware into an essential piece of home technology. It wasn't a conversational, connected, voice-activated system like Google Home or Amazon Alexa, and game developers lost interest in the device as virtual and mixed reality rose to the fore. The Kinect was a product out of time. That's not to say it didn't contribute to some truly wild experiences over the years. Developers quickly applied Kinect to surgery, physical therapy and a range of other medical uses. Three years after its debut, the Kinect was able to read sign language. Musicians flocked to the technology, applying it to live shows and videos. And then there were the games: Fantasia: Music Evolved, D4: Dark Dreams Don't Die and Fru were brilliant examples of the breadth of experience possible via Kinect's gesture-tracking interface. Even Kinect Sports Rivals, for all of its flaws, laid the groundwork for local multiplayer in motion-controlled gaming. Below, we've collected a handful of trippy, strange and downright cool Kinect experiments from its seven years on the market. The Kinect is dead; long live Kinect. The Aquatop projector turned a bathtub into a touchscreen surface, powered by bath salts and Kinect. From researchers at the Koike Laboratory at Tokyo's University of Electro-Communications, Aquatop let people pinch and drag the water to manipulate images and play games — all without the fear of getting a phone or tablet wet. You could also call this one the “Chewbacca cosplay simulator,” if you're feeling saucy. New York-based artist Daniel Rozin created a “mirror” out of nearly 1,000 black and white pom-poms, using the Kinect to track people's movements and power 464 servos to respond in kind. This is the artistic side of Kinect — something ridiculous, thought-provoking and completely impractical. Once upon a time, the New York Hall of Science hosted a sprawling, interactive forest designed to help kids better understand the core tenets of sustainability. 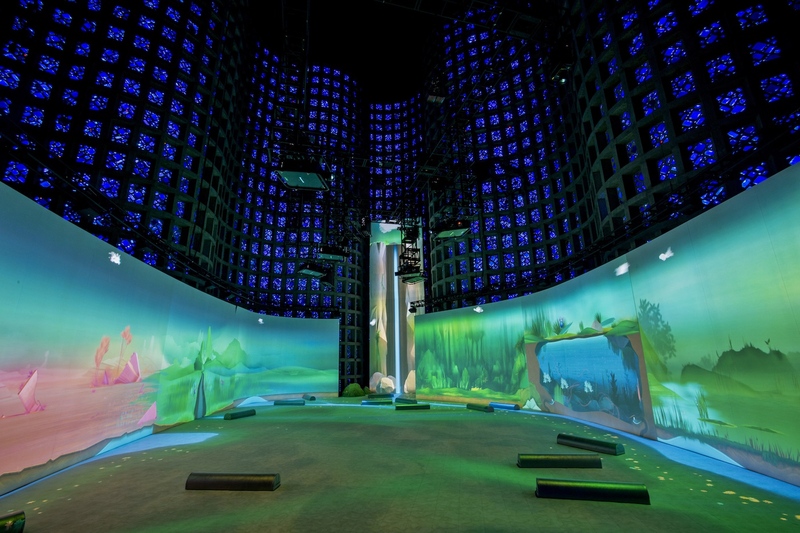 Connected Worlds featured six different digital biomes, including a 40-foot waterfall and movable “logs” lying about the play space. It took a dozen Kinect cameras, dangling in midair, to make the whole thing possible. Old, meet new. Composer Chris Vik added Kinect to a huge 83-year-old pipe organ in Melbourne, Australia, and he was able to play it with gestures alone. The Town Hall organ had been retrofitted to accept MIDI input in the 1990s, so Vik wrote some code, hooked up a Kinect, and voilà. 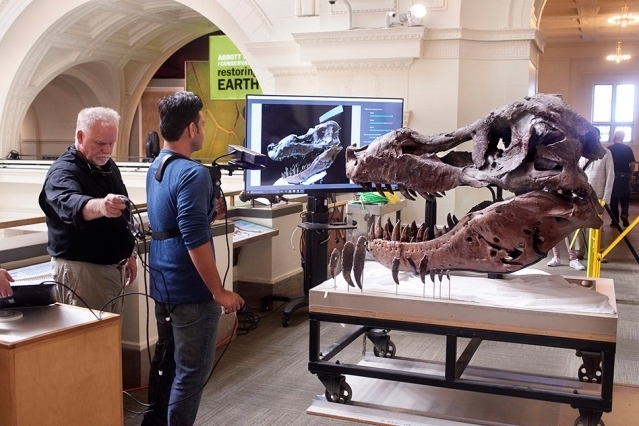 In July, scientists at the Field Museum of Natural History had a problem: They needed to scan the skull of a Tyrannosaurus rex, but their equipment wouldn't fit around the beast's massive jaw. Enter: Kinect. Researchers were able to scan the entire five-foot fossil and investigate a series of holes in its jaw, all for thousands of dollars less than using traditional scanning systems. Nine Inch Nails' frontman, Trent Reznor, and art director Rob Sheridan are pretty big nerds, and they took the Kinect under their wings on a festival tour in 2013. During his set, the Kinect tracked Reznor's movements and projected them onto a series of mobile screens as a distorted kind of mirror. We talked with Sheridan this week about the death of the Kinect; read his thoughts right here. Self-taught South Korean programmer Jae Kwan Ko took the Kinect to a new level of militaristic might, applying the hardware to the Demilitarized Zone separating North and South Korea. The Kinect system monitored the border for movement, and it was even able to discern the difference between animals and humans. RoomAlive was an internal project from Microsoft that represented the dreams of gaming and sci-fi fans worldwide. It essentially turned a living room into a Star Trek-style holodeck, projecting interactive objects and environments on the walls and floors. RoomAlive never made it to the stage where it was ready for consumer consumption, but the fact that this type of technology existed — in 2014, even — was incredibly exciting. Finally, there's this: The best use of Kinect in the history of mankind.